I’m writing by the light of my new LED bulb by Austin-based Firefly LED Lighting. Temporarily, it’s in the socket of my dining room fixture, but when I’m done writing, I’ll move it to my garage. Out there, as I check in on laundry and set garbage in the bin, the main overhead bulb gets a lot of on-off, on-off, which is the kind of activity that wears out traditional incandescent bulbs. I frequently have to change the bulb out there. And I can’t have the garage light burning out on me, leaving me in the dark. You know, scorpions. It will be a long while before my Firefly burns out: 60,000 hours according to the box. At $33 a bulb, using approximately $1.20 per year in energy costs, that’s a pretty good value. I don’t do math, but I’m pretty sure that’s a pretty good value. Shown here is the PAR-20 in Warm White. 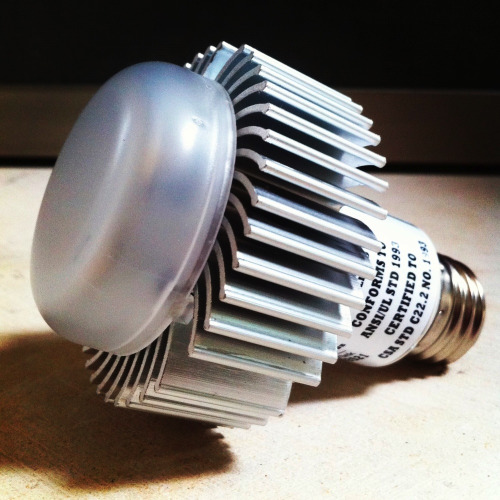 Its brightness is 305 lumens, which is the equivalent of a 40W traditional bulb. Brighter options are available. A Cool White color is also offered and recommended for outdoor/security functions. I didn’t test the Cool White, but suspect it’s even more “white” than the Warm. Unfortunately with the LED, you’re going to lose a little bit of that softer, slightly yellowish glow you’re accustomed to with traditional incandescent bulbs. In the Gallery, you can see the “white” Firefly glow in the hanging fixture, and how it contrasts with the old school bulbs in the background. Firefly does offer tinted lenses, so if you’re serious about muting the whiteness, there’s some hope. These LED’s also are capable of “dimming,” but if you’ve never dimmed an LED, you may be surprised (like me) to discover it’s not a gradual reduction in light. Travel the dimmer, and it instantly “flicks” to a lesser glow. Good, but still not the same. Most surprising to me is the temperature. Unlike a regular old light bulb, these Firefly LED’s are cool to the touch, even after burning for hours on end. The spiral crown encircling the lens is beautiful to look at, but it’s not for aesthetics: these parabolic aluminum (PAR) flanges dissipate heat away from the core. I like these Firefly LED’s. I like their weight, I like their metal, I like their modernity. I imagine a lot of folks get excited about them because they like to think they’re somehow helping polar bears or saving a tree somewhere, or some other high-minded nonsense. And that’s fine. Hey, whatever lights your ganja. For me, the greatest benefit of these Firefly LED’s is convenience: I won’t have to change the bulb in my garage for 25 years or more. That’s a long time seeing the scorpions, before they see me. Visit Firefly LED Lighting: Here.